This entry was tagged Klein; Naomi. Bookmark the permalink. This is probably one of the most important books I have ever read- I think about it very frequently and it often comes up in conversations. It was quite uncomfortable for me because my father was actually working for the World Bank on the very operation in India that is described in this book- installing a cellular phone network for India in exchange for India taking on austerity measures once certain milestones had been reached. 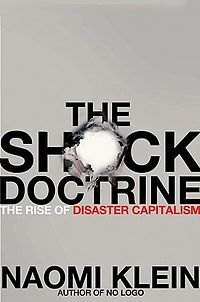 Since reading the book I have seen the shock doctrine as described in this book in use again and again- in America and now in England and all over Europe- the crisis in Greece seems an almost textbook example. While I don’t think it has all the answers, it is certainly an essential data point when thinking about or discussing world politics.